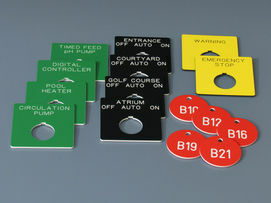 Now you can engrave a coordinated family of color-coded valve tags and legend plates. Keep staff aware, at a glance, of pipe contents, valves and plumbing system characteristics. A comprehensive, up-to-date equipment identification program like this helps you avoid costly, dangerous mistakes and gives personnel valuable knowledge. 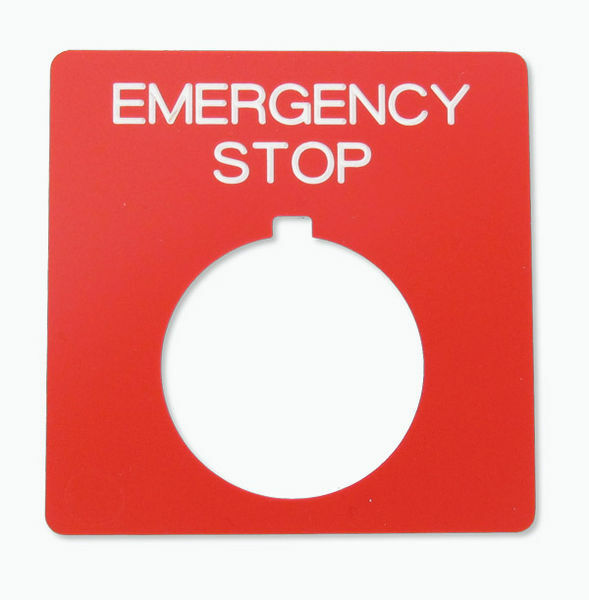 We'll supply the blanks, you perform the engraving – a solid combination that will improve communications, create design uniformity and enhance personnel safety. 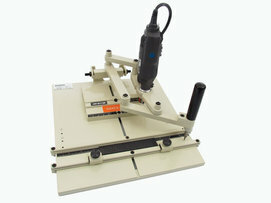 Scott Machine is your one-stop shop for all of your labeling projects. We can routinely create custom-shaped legend plates. Send us a simple drawing (a fax is fine) that shows the hole diameter and shape, outside dimensions and the colors you want to make the labeling of your control panels, pushbuttons, switches and lamps stand out. We can return the blank legend plates for you to engrave specific text – or just send us a spreadsheet of the text and we'll engrave it for you. This versatile engraving machine with the small footprint is ideal for creating valve tags, “first name only” name tags and other small items requiring minimal text or for changing text of similar lengths (e.g., Pump, Cold; B19, B21). 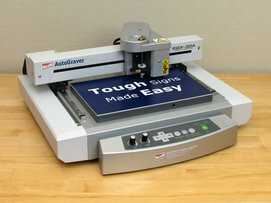 Fonts and cutters are color coded to simplify operation for even inexperienced users. The machine fits comfortably on the corner of your desk or benchtop, leaving plenty of room for movement and other desk items. 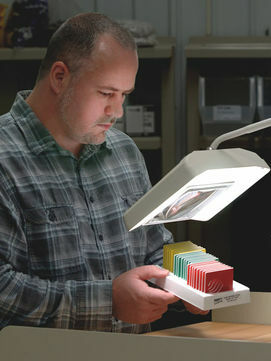 Don’t draw a blank when marking your valves…order them instead from Scott Machine. 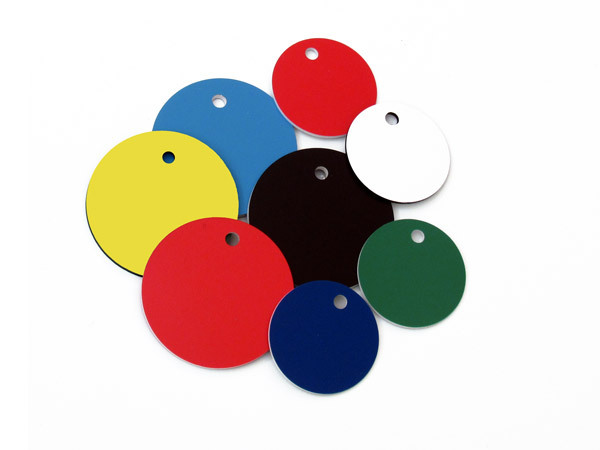 We have color-coded valve tags readily available in dozens of standard colors, diameters and hole sizes so you can coordinate your labeling system professionally and safely. 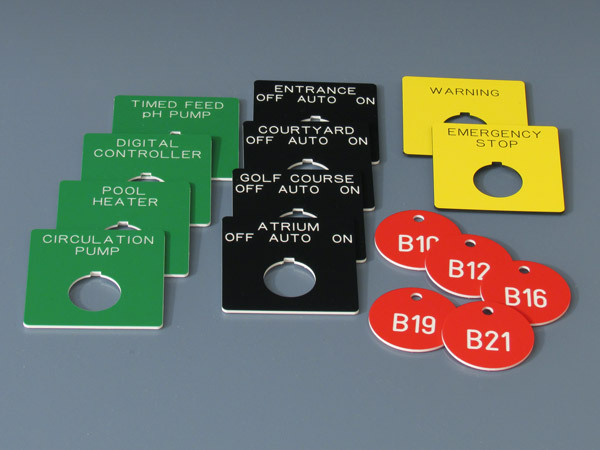 Create a valve tag program that's clearly understandable at a glance, with a well-chosen array of color-coded components. Our experienced team at Scott Machine can offer suggestions and provide guidance in creating a system for your company that warns and informs with color and consistency. Engrave your own custom valve tags, legend plates and lamp bezels with a handy, desktop Scott engraving machine. We can also supply all of your color-coded valve tag blanks for one, easy turnkey operation.